We just adopted a leopard gecko from some family friends, the tank was pretty dirty so we decided to clean everything and do a remodel. Here's a pic of the new setup. I used slate tiles with paper towels underneath plus some reptile carpet. We also switched from overhead lamps to UTH with a thermometer. 1) What's the best way to attach the digital probe? I put it on top of the slate and taped it down with duct tape right in the middle of the hot hide. I saw a few post/articles about using tape, but wasn't sure if tape was really safe for geckos. Plus, with the heat, won't the glue weaken over time? 2) I'm putting the tank on some built-in bookcases (that would be very expensive to fix) and don't want to damage them with the UTI. Is there a good material to put in between the tank and the top of the bookcase? A row of tiles? 3) Until I sort out #2, I'm using the lamps I got with the tank setup from our friends, but I thought I'd test out the automatic shutoff thermometer. With the probe covered with duct tape on top of the slate and fully taped down, the automatic shutoff kicks in 90.3-ish which is great. However, using a brand new digital laser thermometer, it was reading 100-110 around the surface of the slate near the entrance of the hot hide. Testing a few surfaces around my house, it seems like it is reading much higher than what it "felt" like, but it also seems unlikely that a brand one is broken. I'm not sure which one is measuring correctly. Is it safe to use the existing day/red-night lamps on top of granite (the tank used to have blue sand) while I sort out the UTI? Should I use them full-time or plug them into the automatic thermometer? 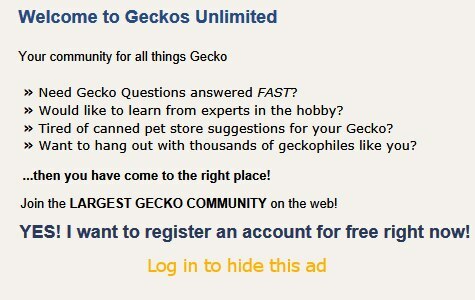 Congrats on the new gecko. The tank looks good. If it's a 10 gallon tank (10"x20" footprint) you may want to consider getting a 20 gallon long (30"x12" footprint) which is more appropriate for a leopard gecko. I have been using enclosures with UTH (you do realize that UTI is "urinary tract infection, right?) for over 15 years on nice wood, particle board, and, recently, on our newly installed oak floor with no adverse effects. I place 4 small tiles or plastic dominos under each corner of the enclosure to raise the enclosure about 1/4" and ventilate the UTH (the UTH comes with these 4 little stick-on plastic "feet" but I feel what I use provides for more space underneath). When you talk about the shut-off thermometer, I'm assuming you mean a thermostat? If it's not clear, a thermometer only measures temperature and a thermostat measures temperature in order to regulate it. I simply lay the probe on the hot side, but sometimes, when it won't lay flat, I put it in the warm hide and use the bottom of the hide to hold it down. Duct tape is fine. I recommend going with the reading of the laser thermometer and turning down the thermostat (which is what I assume you have) until the laser temp is in the low 90's. Looks ok- the only thing I would change is put the UTH on the OUTSIDE of the tank - that way there is not adhesive of any kind inside the tank. Reptile skin and tape don't go well together. Also make sure the UTH is regulated with a thermoSTAT. A thermoMETER will just tell you what the temperature of the pad is as it cooks your lizard. A thermoSTAT allows you to program the temperature of the heat pad so that it turns off / on or cools/heats as needed. For the most accurate use of the UTH, you put the thermostat probe between the outside bottom of the tank and the UTH like a sandwich. Using the heat lamps with slate is fine, esp if you need to raise the ambient temperature. You didn't mention how you are measuring all the temps. Each side of the cage should have a digital thermometer and you can test the infrared heat gun (you mentioned it seemed to be reading high) by pointing at either boiling water or ice since these have known temperatures. Often the IR gun reads higher because it is measuring the surface temp of whatever you are pointing it at, digital thermometers read the "air" temp of the area they are in. Most digital thermometers are also off somewhat from the true temperature. Make sure all the areas of the cage are within the ranges given in the care guides on the site. Hot Hide 88-90, Ambient air temp on hot side no higher than 84*, cool hide no higher than 75* and ambinet air temp no lower than 67* ever. They should have one area that is 86-90 at all times for digestion purpose. Last edited by SpottedDragon; 12-30-2018 at 04:02 PM. While I agree that once it is attached you can't move it, at least not without a huge pain the rear, not having the probe in contact with the pad makes the thermostat less accurate. I've seen people attach the probe to the outside of the pad under the tank and have it over heat, same with placement of the pad outside the tank and the probe inside the tank. But I would recommend keeping the probe inside the tank and the pad outside the tank over keeping both in the tank. ***I also don't recommend any form of adhesive in a reptile tank - no tapes, no stick on thermometers, nothing that could possibly come in contact with the animal (hot glue is safe once completely cooled and dry). I've had to try and remove things like duct tape and the stick-on gauges from many species and it almost always results in torn skin if not much worse - including de-gloving to the point of euthanasia. Thanks for all the replies, sorry for going dark. Holidays are just too chaotic. Thanks for your help. I think everything has settled down in my world. I got the UTH installed with probe in the tank. I read a few places that talked about tapping it down, but your comment has me worried. I have a hot glue gun so maybe I'll use that this weekend when I clean the tank. The UTH (not UTI, haha!) seems to have no problem getting to 91 (my target temp set in the Thermostat), it then turns off and kicks back on around 88, so basically the hot hide is 88-91 which seems ideal. The cool part of the tank is pretty stable at ~70. Welcome back! Your temps sound excellent! Your thermostat is behaving just like it should. Just to be sure: Is your UTH "taped" to the glass bottom underneath the enclosure? Nashua tape is good for that. It's challenging to properly ventilate the UTH when it's kept inside an enclosure. I just lay my leo's thermostat's probe + a digital's thermometer's probe on the floor of the warm dry hide. Yes, I do tape them together with a small piece of Scotch-brand Magic tape. I've never had any problem doing that. /\ That way both probes measure the temperature a leo feels when he lays in his warm hide. Correct, it's basically taped down on the floor of the hot hide. My Gecko ends up sleeping on the probe sometime. At first I thought he might skew the reading with his body heat, but quickly realized "duh, it's a reptile". Thanks for the tape suggestion. The UTH is inside? An UTH needs ventilation from the bottom. What size (dimensions) is the enclosure? Please note my edits in post 8. Last edited by Elizabeth Freer; 01-04-2019 at 01:54 AM.